Hi! Um, this is my page. I'm rkdmf on KGS. I find endgame theory really interesting and I would like to study CGT. I'm also interested in unusual boards/rulesets but haven't had the chance to try them. I will try to start a blog here with things I'm learning about! 1. Playing near thickness is small, unless it's actually big, and then it's big. 2. Use thickness to invade, if the invasion is good. Don't use thickness to invade if the invasion gives the opponent a large number of points or a useful wall. 3. Encourage your opponent into a stupid and pointless fight against your thickness, unless the fight would also be stupid and pointless for you. 4. Use thickness to build a moyo, unless moyo is a burden. Okay, so there are three important things that I think I learned or figured out a lot about recently. They are: box shapes and bases in fighting, center-oriented strategies, and big turns in the center. So first for some general ideas about complex fighting. Complex fighting (as opposed to attacking, which is much more straightforward) happens when important groups get weak on both sides. Whoever gets a locally good result (stronger groups) will get to become the attacker and hopefully make a profit by attacking. Since being hard to attack locally is so important, usually running out to the center first is considered good result. It doesn't matter so much if a group is still unsettled so long as it makes it out of the fighting area into a less interesting area, because the forcing moves against it don't affect the fight much and therefore are worth less there. This is all I used to think about a lot of the time. Actually, it's more complicated. During a fight, there are lots of moves like hane and keima that look really nice. Whoever gets to play them first gets a good feeling - not only are they closer to escaping to the center, they are also often doing it while ruining opponent's shape. The problem is that sometimes these moves can be immediately cut, starting a capturing race. If your liberties are too low to play a turning type move, then being ahead in getting to the center is not really that useful, opponent can simply follow you out and the first-move advantage is a bit wasted. So, sometimes it might be better to spend a move in a running fight getting a 2-dimensional shape instead. I remember An Younggil saying this in a pro game review once. There are a few reasons why I think it's nice: it's harder for them to turn, because you often gain big eye liberties and can just cut, and also they can't cap you in 1 move anyway. Then their only option is to play some defensive move (otherwise you can turn next), and maybe you can tenuki since your group now has nice shape and center access that can't get cut off. This is also something to look at when invading deeply on the third line: if you can make a base afterward, then their cap is often nothing to be afraid of. Anyway, a base makes a box shape with the side and so it's really hard to fight against a base. It's either a large number of eye liberties, or even if the base is stolen, a wall facing the center with plenty of liberties. A base can win a fight where it's locally outnumbered. A base can win capturing races even when it's cut off from the center. That's why base is so good. Obviously, giving white a wall with many liberties facing the center isn't always a good thing, but, given enough outside strength, a base has a weak point. But anyway, a during fighting a base could be thought of as having at least as many liberties as this one in this sequence ends up with, since it will either have that or big eye liberties. Note that if white gets to attach underneath at a before the base stealing sequence, white gets much stronger, and stopping that attach is one of the benefits of stealing the base if black intends to attack severely. Anyway, let's look at a more normal example. In this fight, white has 3 groups while black has 2 and black also has allies nearby. Black's invasion might look like an effective splitting attack on 2 white groups that also threatens a base-stealing move. But actually it's quite hard for black to profit from attacking due to the strength of white's bases (and the lightness of the one stone makes it even more troublesome for black). White's bottom right group might become weak if black gets another move, but it's not weak yet; the base-stealing move is only severe when black is stronger outside, and might just strengthen white if black played it immediately in this case. One thing I found unusual until recently is that everyone seemed to place a really high value on "consistency", and that taking some cash in the opening and then giving up territory on the side in order to build a central moyo was considered bad strategy. It's not immediately obvious to me why this would be true, if all the exchanges are locally reasonable. The center might even be easier to defend if it's slightly smaller, since there's less space to live inside. But something I realized recently is that the value of playing for the center just decreases, the smaller the area in the center is. Easier to defend might save like one move to play some random stone in the middle that kills any chances of invasion, but that's not really relevant compared to the other issues. First of all, "center-building" type exchanges tend to give the opponent solid territory, and this amount is a constant per exchange. The amount of potential in a roughly square-shaped center area is s^2, where s is the length of the side, but the perimeter is 4s and therefore the amount of cash paid for the moyo is generally O(s) (actually, while side cash is O(s), corner cash is sort of O(1) - consider three stones making territory on the side vs. three stones making territory in the corner - just by nature of the corner being enclosed, a handful of corner points magically appear added to the territory. but the specifics of exchanges near the corner can't really be generalized here, other than to say the obvious, which is that the centrally oriented player has to be careful not to give up 4 corners for free). The larger s is, the better the exchange is. Influence facing either player's area of potential is worth more than influence facing nothing, which is worth more than influence facing solid territory. So if paying cash for central influence is ever good, then it should continue to be good until the moyo is complete (i.e. mostly cash). 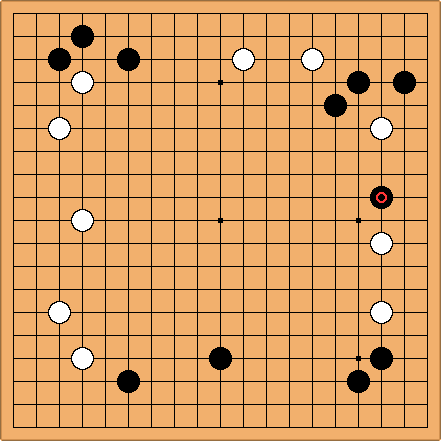 Relatedly, on the territorial side of things, the goal is to ruin the center potential as efficiently as possible, so that not only are the pressing exchanges bad in retrospect, but the sum of badness outweighs the number of moves spent by the territory player in the center, even though those moves didn't make points. This makes openings like double 3-3 questionable (center strategy might become too easy), even if one 3-3 wasn't (which I guess it is in current professional practice). Another reason why center strategies tend to require commitment is that by themselves, stones in the center are very vulnerable to cutting. They are hard to chase down and kill, but that doesn't mean they're strong when cut, either - it's also hard to make independent life in the center compared to a position on the sides. And that means it's very easy to use their cuts and weaknesses to get strong. This makes them inherently inefficient at controlling territory - even if surrounding it from four sides is not necessarily inefficient (due to high s and square shape compared to inefficient rectangular shapes found in territorial play) - because controlling territory requires being strong enough to kill an invasion, which means winning capturing races unless all cuts are fixed. So the only way that center territory really works out is if there are enough stones working together, sharing miai connections and eyespace that cutting them doesn't really work as well anymore. Since taking cash gives the opponent stones or forcing moves in the center, the standard for taking or destroying cash should be much higher in games where the center matters. This is just as true for both players - influence facing center potential is more valuable than central influence facing nothing, no matter whose center it is. This isn't to say that you can't play for territory, and then switch to the center when the time is right. For example, if all the interesting territories seem occupied, it should make sense to flip the switch and start playing moves aimed at expanding the territory with the most growth potential into the center, including playing shoulder hits and other center-building moves. The s^2 part hasn't increased, but there is just not as much potential left on the sides, so giving away stones there is worth less. But, after the switch is flipped, you also become committed to try to hold sente and turn that center area into territory, otherwise the original exchange for central influence might become bad anyway. So, I guess this is often the plan behind taking side-facing influence in corner situations. Without as strong a commitment to the center, you can get somewhat locally inferior territory on the side, but once everyone is done making territories, then your center-building exchanges become useful to grow a moyo that starts from the side. But if opponent interferes with the center, it will cost them moves while you still have a side territory, so it's harder to make you inefficient. As to how to build central influence with favorable exchanges, well... corner groups without space for 2 eyes are heaviest as there are 2 directions they can't run. Instead of annoyed but jump to the center, they will die and become points for opponent if ignored. So it's easier to attack a corner stone for outside profit than any other stone, even though it is also easy to live in a corner. For example, play a pincer against any stone on the side or center and opponent can probably easily tenuki, leaving lots of aji and not clearly taking a loss. But if you play some double approach in the corner and opponent tenukis, it could much more easily be a bad result for them. This is why I think a center oriented strategy must also at least approach corners in the opening. Influence oriented corner moves are virtual double-approaches to the group the opponent will have when invading. So they are attacking moves, taking influence while threatening the opponent, which is a bigger gain than simply taking influence by playing some random stone in the center. This is why unless you really use some of the special properties of tengen, by comparison to moves like 5-4, it seems questionable in a center strategy. Getting one use out of it as a ladder breaker or a direction to fight toward is surely worse than just playing 5-4... not to mention that opponent can actively try to make tengen seem misplaced, shapewise or ladderwise, by just 1-2 spaces from some other random point in the center. So, I guess this is why tengen is so hard (but also interesting) to play. But that doesn't mean it's necessarily bad. This sort of situation seems to come up a lot. Building-wise, black would probably like to work on the bottom right with d, e, f, or g. White would like to expand by playing z, y, and x in sente, and then coming back for the very satisfying w. The bottom right isn't that interesting though, with settled groups on the third line on each side, and it seems like white might build faster than black. If white gets to build, black a might be too deep, and I think b should still end in gote (however, if black can do well in sente with b, then I think that could also be a good move). Also, even with f, black will still have some weakness in the bottom right, which white can look at exploiting next, even if f is not too small to already be bad. Black could also play a immedaitely, but it will probably be gote, after which white will have both points and sente to approach the bottom right. In both cases, I feel like black will give white tedomari. A move like c, while being intuitively very appealing, has its downsides, too - it leaves a lot of open area for white to invade, so it's not always best to play this sort of move. But in this situation, I feel like c is great. It pretty much forces white to invade, since it shifts the balance toward black having more potential. If white comes in at f, black can either answer at g, then take a, or pincer, and then build the right side on a larger scale than white. In both cases, I feel like black got tedomari this time. Since the induced invasions and reductions are generally gote, the c area could be thought of as an extremely large double sente, and that's why I feel like it's the only move for black. So, when considering playing intuitively big turns in the center, I think it's useful to try to read to see who gets tedomari. That should help determine whether it is the only move, or a move that's just playing for the center too early. I spent a while getting several opinions on this corner situation. Actually, it seems really complicated. I did a pattern search on the right side, and found pros almost always play a if the top left is white or b if the top left is black. After black a or b, white usually played g, after which black never pincered and white usually played y, or sometimes z if black picked a. White sometimes played z without playing g, in games where either player had an urgently large center. e was the next most common. d, f, and h were all extremely rare. c and g did not show up at all. Also worth noting is that the pros usually play v before white gets a chance to approach the top right, presumably specifically because it's very annoying for white then, but much more difficult to play now. I do think the search could be misleading, since in pro games black doesn't get three corners - in most of the b cases, black had a stone at u, making a nice shape. Actually, there was one game, O Rissei vs. Cho Sonjin in 1995, where black approached at the squared point, and white played pincer, giving black the corner. 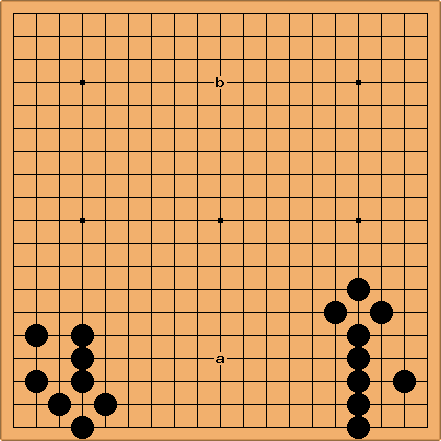 Cho played b, and O exchanged g, then played y, and later played t before Cho could play in that area. O won the game. My worry with a is that white gets to make a large thick territory with g and y, when white originally had weakness (for example, if black had played v earlier, white's bottom right group could be attacked). In exchange, black gets a solid group on the top side, where black already had a solid group. Also, black's group can still be attacked if white gets t later, while white has at least three eyes, like in a good way, if that's possible. Also, white can choose z instead of y and then I feel like black has no good answer. So I feel the territorial balance is bad for black (black was first to the corner, so white getting gote plus an inferior result is expected, but black ends up with around 10 points while white makes 15), and the the strategic value is also in white's favor, and black is just getting pushed around. Of course, black also leaves some room for expansion on the top side, but playing there doesn't look very attractive compared to if black had b, for example. I like b a bit better, but after g and y it still feels like white "fixed in sente". Also, since black's top left is already settled, u feels slow, but s leaves two invasion points. 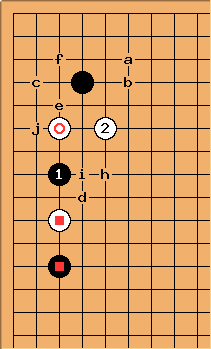 Actually, I'll have to wonder about q, which looks locally odd, but leaves less weakness and has a nice followup later at o or p, depending on the board (o seems especially nice if white hasn't fixed the left side). If white plays z instead of y, black w is annoying for white, but white is perfectly happy to just take y. Also, instead of settling, white can double approach or invade the corner, both of which seem annoying since white has a strong group on the right. In any case, it still doesn't seem ideal for black. I think c is worth considering, but the pros don't play it. The problem, I assume, is that white will invade, since if black cuts for a wall facing the right side, white still has a strong group on the right side. But if black blocks the top, white takes many points. And even if black's wall facing the top is nice, the top is not that interesting. The idea behind d is to cut to overconcentrate white, which is often considered a good thing. Black's resulting strength on the top would be useful, but maybe not the best. Unfortunately, white would also get very strong, right next to the bottom where black still has serious weaknesses. So I think d would be a whole-board failure. On the other hand, I think exchanging e does some of the same things, but better: it stops white from sliding, it allows black to take b, and because white's extension is heavy and still "too far", black can still invade or threaten to invade after the exchange. Actually, it might even be easier to invade now that white can't exchange something like h. Also, it doesn't really affect black's bottom. Lastly, f, g, and h are similar to e: they try to stop white from entering the corner. Unfortunately, they don't have followup at d, making it easier for white to ignore them and attack black, and while the top is not super interesting, it's also not so boring that black wants to get surrounded and live in the corner. And because white is already strong on the right side, a fight could be annoying for black. I suspect g is not played by pros because h is stronger and f has better followup. Actually, g is really hard to fight with, since allowing white the peep if white double approaches is the most painful thing ever. To me, the pincers v, x, and y all have a big problem, which is that they start a difficult fight. 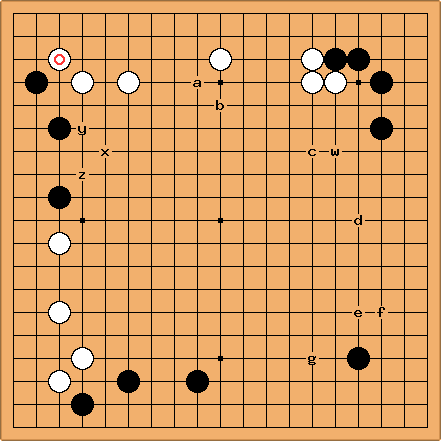 If white jumps to z, then plays g, in tewari it looks like black played a or b and then played a silly invasion. Even if z is worse than y for white as a response to a or b (and it's hard to say if it is, even though pros usually play y), it is not nearly as obviously questionable as black's early invasion. The same goes for pincering after white g. If white doesn't want to slide, white's double approach also seems to make black look bad. Actually, v has been played in a really weird pro game, but I don't know what he was thinking. The other times the pattern showed up, it was because black tenukied somewhere for something deemed more urgent. Anyway, on this board, I think the slightly odd-looking sequence e d b is best, and black's followups would be invasion, capping d to threaten invasion, or playing something like q (I wonder if white can still live in the corner after q?). Even better would have been to just play v earlier to prevent the whole situation. The previous situation with x/y/v could be contrasted with one like this, where black 1, the most common professional move, actually threatens two baseless white stones. 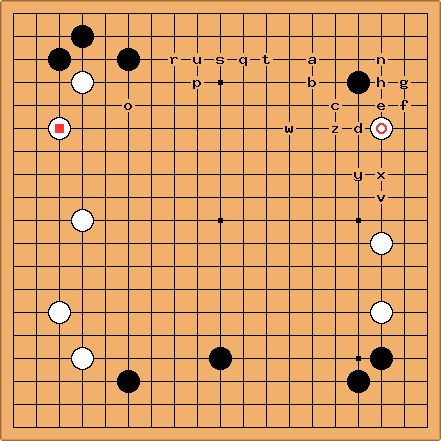 But even in a situation like this where white doesn't have base, if black doesn't have the squared black stone, black 1 is less common than both a and b, presumably because it gives up the corner and the squared white stone still has options even if black gets d. Anyway, when black has the pincer, the most common sequences after white 2 are b-d-e and a-c-d-f. b-d-c, b-c-h, and a-d-c are variations. I guess white's usual thinking is that b leaves two doors, but a is urgent enough to give up on the square stone. 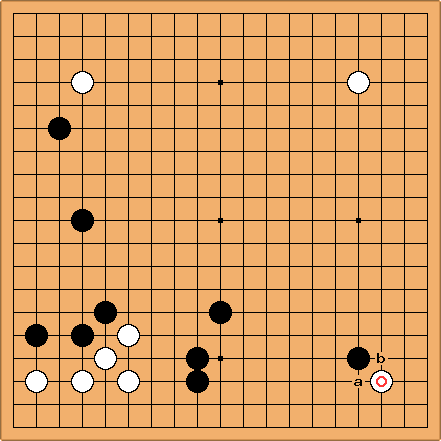 In the b-d-c pattern, white usually chooses not to double approach and fight, and instead kills the aji with i. Presumably this is considered okay for white, even though black can use sente to finish the top and seems to be getting everything, because of the way that white can answer c - i makes white thick (compared to the e-j exchange, which still leaves a lot of bad aji for white). Since I'm kyu player, I am really good at failing to use thickness well. I will try to be all scientific about it and come up with some cases or rules or something. Then later I can find out they were totally wrong! Yay! I will list the "rules" in anti-proverb format since the proverbs are usually comically misleading when it comes to complicated subjects like thickness or fighting. But first of all, let's talk about the cases! Attack for profit, usually somewhere outside of the thick area, made possible because a group can't live by tunneling through a wall. Invasion and reduction, because a group can live by connecting to thickness. So, when do we use it for what? Black to play. Not trick question. This should be mind numbingly obvious at ddk level, but one strategic experiment I tried was always playing as far away from thickness as possible, and many, many points were thrown away. This shows up in slightly less obvious form too. According to a 4d, a is correct. The proverbs say not to use thickness to make territory. I think one of the reasons they say this is that making territory from thickness directly is actually pretty hard, and it takes a lot of moves to draw the box, and your opponent can reduce in the meantime. One rough estimate when counting is that influence is worth around 2 points per outward stone and thickness is worth around 3 points per outward stone. So, if the game situation is such that you can use your thickness to make more than 3 points of territory per stone, then it starts to seem really appealing. Of course, that's only if the rest of the board is uninteresting - if there are bigger moves (fighting and/or wide areas), then a move which strictly makes some expected number of points per stone without adding any strategic value (which it doesn't, since it was near thickness) is probably not going to be the biggest place. Another related idea is that there are some optimal distances for 2 walls to be spaced apart, and not necessarily "as far as possible". One ideal spacing is "as far as possible without the opponent having room to live" - if the moyo can be successfully invaded, the value suddenly drops to maybe something like half of what it would be were the whole thing cash. Then, once you're too far for that, you want to be even farther, until it's "as far as possible so that one move can still make it impossible for the opponent to live". This way, it's still urgent to invade or reduce, but the amount of potential to turn into territory by attacking is maximized. But, if the walls are really far apart, then the opponent can play a wedge, have essentially miai life, and it's not as good anymore, even if the walls still have value. Speaking of stones with bases, this also sounds a bit obvious, but well, sometimes the right move is a really awkward looking 1 or 2 space extension from a wall, if it turns out to be the right attacking move to keep a group weak. Actually, the example here is cheating a bit. We learn to block on the wider side, and of course the empty space is wider than a 5 space extension, but the reason for blocking the wider side with a double wing is that one of the stones is pretty much super suboptimal and going to waste (since it's a random small extension near the top of the thick wall), and so we want to forget it exists and maximize the value of the other stone (i.e. have it as far from the wall as possible). But if it's not double wing, then having a 5 space extension from the wall's face might be somewhat close (ordinarily, we wouldn't play there), but it's still way better than having a random stone as a small extension to the top of the wall, which we can choose to completely avoid. So basically, it's not necessarily that this is an example of when using thickness for territory is good. It's more like it's not nearly as bad as the other option, which is to play near thickness in a way that doesn't even make much territory. The correct answer is b, tenuki, and wait for opportunity. This is from a pro game. According to An Younggil (8p), white's move at d was correct. 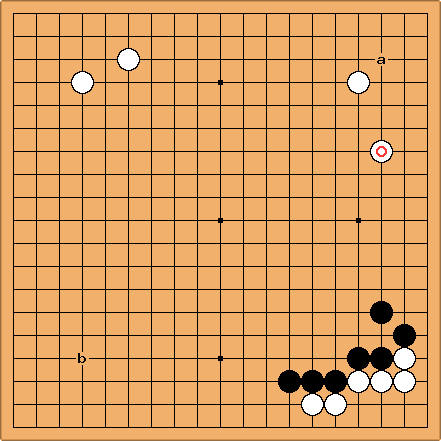 This is an example both of thickness making an invasion live (white won't make a ko shape but instead connect solidly, then black has to fix the outside cutting point because white is thick outside) and of the invasion being strategically good (black's wall won't be very useful and could even come under attack if black isn't careful). White's corner is definitely strong, but black can still easily develop the bottom side thanks to the thickness. If white invades at a, black can attack at b, and white might be in trouble. Black's one stone is strong thanks to the thickness nearby. On the other hand, playing extremely loose or greedy stones in the center might initiate a fight where your opponent makes dame out of everything, in what could have been mostly your center. A moyo is sort of like a weak group. It doesn't make any cash by itself but you're counting on it not being completely destroyed, which means your opponent can sometimes keep sente by threatening it. If you only play passive defending moves, it's probably not going to die, but it might be really painful to give your opponent free moves. So, much like a weak group, if a moyo is in the wrong place, for example next to another weak group, you might be in trouble. If it's next to your opponent's strength, it might be more trouble than it's worth. But if it's next to your opponent's weakness, then all of a sudden it feels stronger and less like a liability. Oh, and sometimes you have to attach to stones to help it out, when that attachment may or may not be a good exchange. Moyo is a decision, just like invading or tenuki from a weak group. So it has to fit the situation. If moyo is the wrong decision, and there's nothing else to do with your thickness, then it's simple! Just do case #3, play elsewhere and wait for an opportunity.